As I noted earlier, the goal of the game is to fill your opponent’s play area up with an assortment of colored and stone jellybeans, causing them to lose. Now this might not seem like the most exciting premise to a game, but the execution is flawless. First off, the Puyo Puyo game play style is addictive in its own right. The simple goal of defeating your foe quickly becomes a journey due to the difficulty of the game. You’ll find yourself on the losing end of the stick more times than you might like, but once you beat an opponent, you will get a nice feeling of satisfaction. The game play revolves around connecting four jellybeans of the same color together, and then doing that over and over again with other colors (or the same color, depending on the situation) and chaining them all together to form combinations that will cause junk to be dropped on your opponent’s play area, making things all the more difficult for him. Conversely, this can be done to you, so be sure to beat your foe to the punch if you want to have a hope in hell of winning. On top of the addictive game play, there are many little touches that help make the game special. Things like little moving eyes on the beans and their gelatinous movement add a sense of personality to the game, even without the Sonic license, and everthing comes through very well thanks to the animated character pictures in the gameplay window. Both your character and the opponent will show a variety of emotions to convey how well they’re doing, or how bad they’re doing, as the case may be. These little touches help add quite a bit of personality to the game, which helps make the game seem like a more complete package, and add more charm to the overall product as a result. Mean Bean Machine is loaded with personality, and that is accurately reflected in the game’s graphics. The graphics are some of the most detailed I can ever remember seeing in a puzzle game (even today) and they stand the test of time wonderfully. The Sonic characters are used to perfection thanks to the animations I mentioned above that bring a lot to the game. This is one of the few examples of a license being used to it’s fullest potential for a given project. As you would probably expect from a Sonic game, you’ve got some nice cheery music throughout the game, with some faster tunes being used when things get close in the game. The sped up music really gives you a nice adrenaline rush, which, when added to the natural excitement that comes from playing this game, can make for quite an interesting combination. 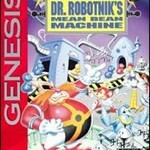 All in all, Mean Bean Machine is not only one of the best puzzle games ever, but one of the best Sonic games released. It makes fantastic use of the Sonic license, and features some of the most addictive puzzle gaming action you’re ever likely to experience. If you don’t have a Genesis, or can’t find a copy of this game, try to pick up Kirby’s Avalanche on the SNES, as it’s basically the same game, only with the Kirby license being used instead of the Sonic license. Also, if you have a Nomad, I implore you to give this game a shot, as it translates very well to the small screen since even the fastest moving beans can be tracked with relative ease.